Another day and another $0.07 of oppressive federal income tax later, we just cannot leave this whole awesome Reston Tea Party thing alone! WHAT IS WRONG WITH US? Fortunately, our awesome, usually anonymous commenters managed to come up with the most brilliant statement yet about the tea party. 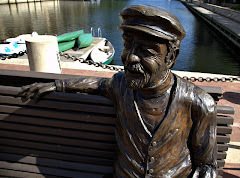 As I was watching the YouTube video of this event, I realized that if you substituted "Reston Association" for "British government", "Reston residents" for "colonial patriots", and "annual assessment" for "tax on tea", the meaning of the speech would be exactly the same and the video would still make perfect sense. In fact I'm gathering up right now my fair trade, organically grown, New Age flavor tea bags to dump them on the doorstep of 1930 Isaac Newton Square! And instead of dressing up as an American Indian -- or before the PC police come after me, should I say Native American -- I plan to come dressed as Bob Simon. We seriously love you guys. Meanwhile, here's what the organizers had to say about the event, on that filthy "web-log" they call the Book of Faces, or whatever. No, really. After making jokes about liberals being baby killers, they're including the unborn in their crowd counts. It's also nice to know we're in such good company as the Huffington Post and Daily Kos. In fact, we're all getting together this weekend to attend a secret bloggers meeting, then gay marry a cat and a dog to each other. For fun. Update: A fun gallery of pictures from the tea party plus another backhanded complement can be found here. Is that sign for the "Morans" as in the political folks, or is it just "Morons" misspelled? It is obviouslly a play on Jim Moran's name. 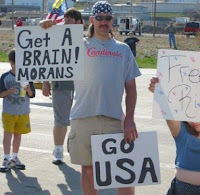 The sign is suggesting that Moran(s)=Moron(s). Do you really need this to be spelled out for you? That picture's not from the Tea Party. It's from some equally well thought out protest from a few years back. You see it everywhere on the Internet, especially on that Evil Daily Kos site they mentioned (aka the Great Orange Satan). I don't know, maybe that's actually Terry McAuliffe in disguise? First Anon to second anonymous, do you really think I really needed this spelled out? Rhetorical questions and all that? I know that guy. He's Rush Limbaugh's mild-mannered alter ego, and he lives in the Land of the Free and the Brave, otherwise known as North Reston.